Craving for a piece of freshly-baked bread? What if you don’t have enough knowledge on baking? Don’t worry; there’s a certain kitchen appliance perfect for you. All you need is an automatic breadmaker! Since price is also a big deal in choosing the right breadmaker, we’ve decided to focus on the most affordable quality options. Check out the best budget bread machine first for us. With its two-pound capacity, Oster Ckstbrtw20 Expressbake Breadmaker can provide a loaf of bread that’s good for more than four family members. It is specially designed for big families. Aside from its large capacity, this product is also extremely versatile. Who would’ve thought that a simple-looking breadmaker could have 12 settings? It even has three special modes for the crust alone. It only goes to show that this appliance can bake any kind of bread you want. Not only that; this bread machine uses a unique ExpressBake technology. Baking a loaf of bread can only take less than one hour. However, this breadmaker still has a 13-hour timer you can easily program to fit your preferences. 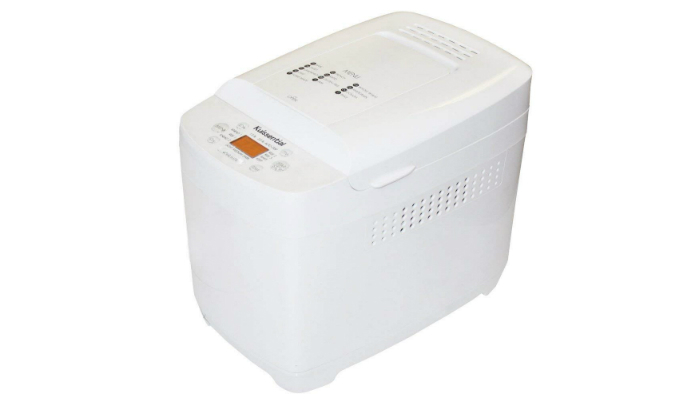 To make things easier for you when you finally input all the necessary settings, this breadmaker has a big LCD display so you can monitor your adjustments. It also has sensitive buttons for easier control. 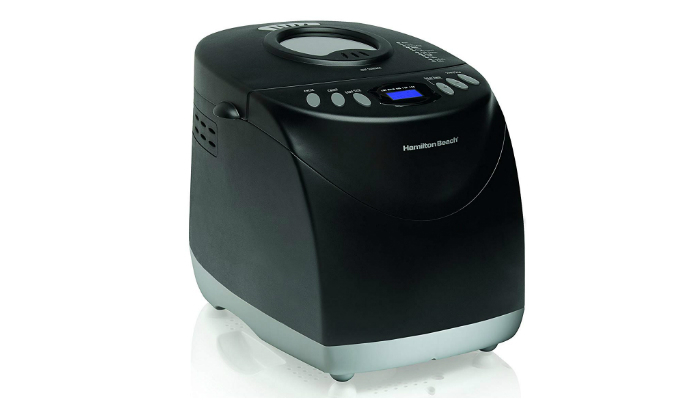 Another option with 12 settings, Hamilton Beach (29882) Bread Maker makes sure that it has a mode for making gluten-free bread. It is an ideal choice if you’re particular about nutrition. Other than the fact that this product promises a wide variety of bread, its settings are also interesting. Some of the most exciting ones are Whole Grain, Cake, Jam, Dough, Sweet, and French. Meanwhile, the Quick Bread mode is ideal if you’re not going to use yeast. This appliance, just like the top product, also has crust settings. Just choose the size you prefer for your loaf of bread (1.5 or 2 lbs.) and the crust’s darkness (light, medium or dark). The machine will do the rest. In case you’d forget adding your favorite nuts and fruits, this breadmaker will even give you a reminder that you can easily hear. As a plus, it has a delay timer so you can put the ingredients inside long before it starts baking. While bread machines are convenient for baking dough, they can actually be a hassle to clean. Cleaning convenience should also be a priority, and this product has it. Just remove the nonstick pan and put it in the dishwasher together with the kneading paddle. 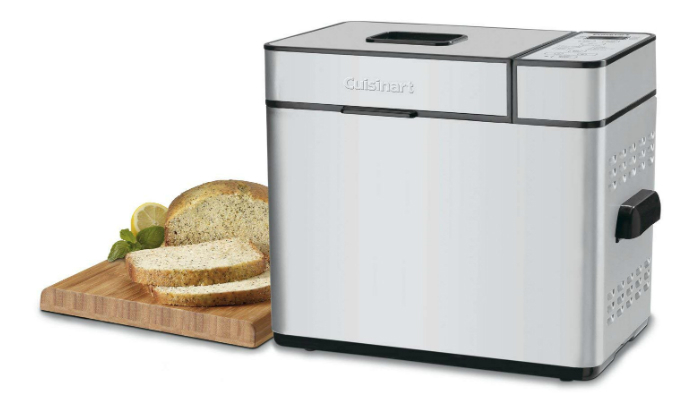 Aside from the usual two-pound capacity and program features, Cuisinart CBK-100 2 LB Bread Maker also highlights its special window where you can monitor the baking process. Just like the interior pan and the kneading paddle, the machine’s lid can be removed for easier cleaning. This product also prioritizes your safety. Its handles stay cool to prevent burning your fingers. Additionally, buying this breadmaker will give you other essential items for free. It comes with a measuring cup, a measuring spoon, and fun recipes your family will enjoy. 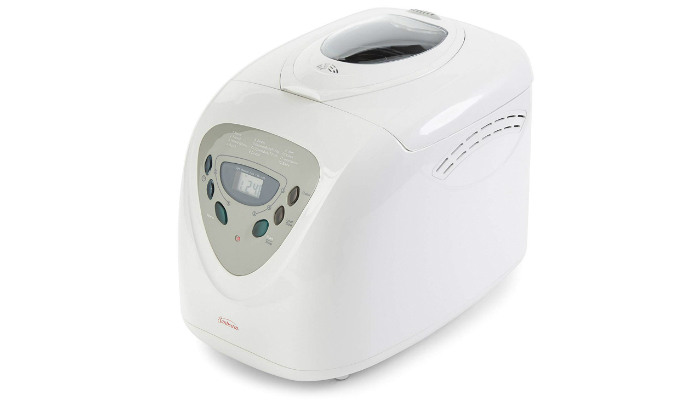 If you like fruits and nuts on your bread, Kuissential Programmable Bread Machine is an excellent option for you. It has an auto-dispenser so you can easily add crunchy, sweet toppings to your bread. This product is so easy to use that it’s almost like a rice cooker. In particular, it has a Keep Warm mode to retain the bread’s freshness even if you’d leave it unattended for a while. In addition, it even comes with a free measuring cup and spoon, just like – yeah, you’ve guessed it – a rice cooker! Do you want to munch on a fresh, warm bread as soon as you wake up? Thanks to the 13-hour delay timer of Breadman TR520 Bread Maker, you can set the baking process to start several minutes before you’re ready for breakfast. This is perfect if you’re home alone. The delay timer is also ideal for people who want to eat freshly-baked bread after a long day of work or errands. Just imagine eating a soft, warm sandwich while you’re relaxing at home. 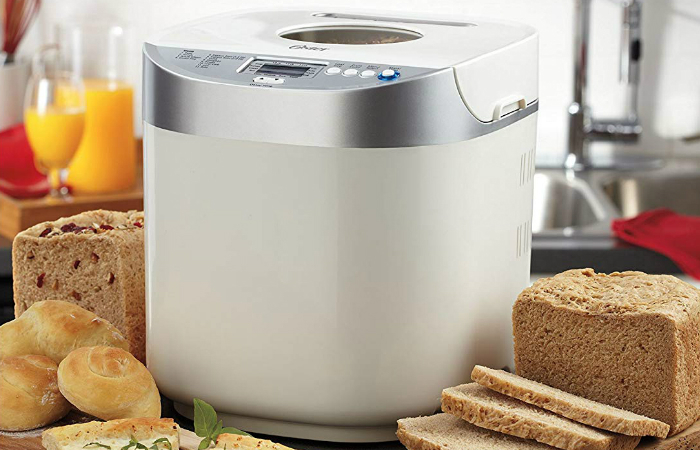 Despite being much more affordable than some popular brands, Sunbeam Programmable Bread Maker has everything you need for convenient bread-making. For starters, it has the standard maximum capacity of two pounds. 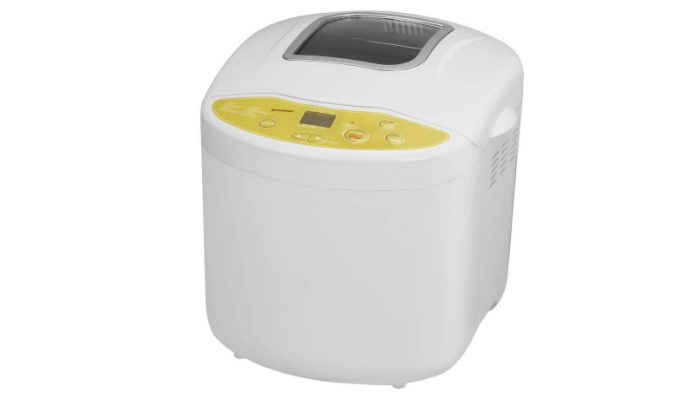 It also has 12 functions and three crust settings, which is the typical feature of versatile bread machines. Of course, we shouldn’t forget about the 13-hour delay timer. This product also has a big LCD display and sensitive push buttons. Lastly, its removable pan is nonstick for faster cleaning. Instead of complicating things by being so analytical, we’ve decided to think about the three obvious factors before choosing the best budget bread machine. Can you guess the three factors that are under your nose the whole time? Since the whole point of this discussion is to recommend affordable bread makers, we shouldn’t just disregard the price. 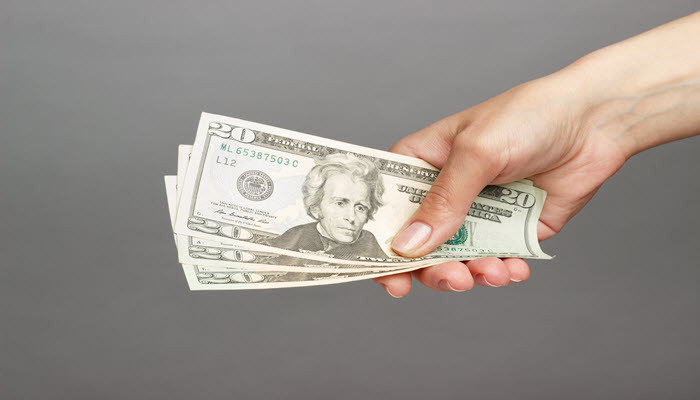 A lot of high-quality bread machines can go for more than $100. Luckily, we’ve come across products as low as $60 that can still work efficiently and stay durable. 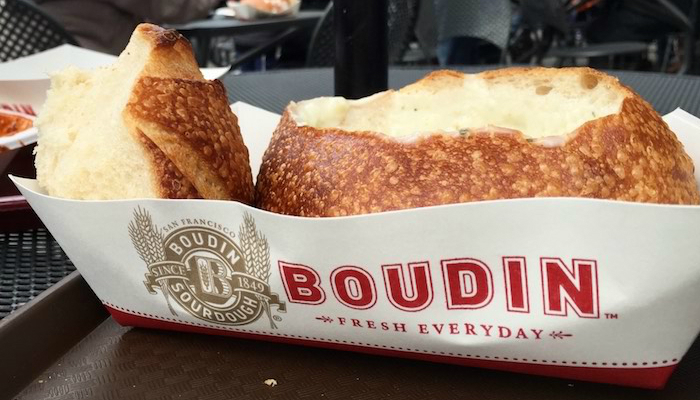 There’s no such thing as the best type of bread. With so many varieties available in cookbooks and recipe blogs, you can’t choose sometimes. One day you’ll be craving for something fancy like croissants, and the next day you’ll prefer something simpler like sourdough. That’s why always settle for a bread machine that has more than eight functions. You know what, just go all out and choose a product that has 12 settings! You’ll have the chance to bake different kinds of bread every single day. How satisfying is that? Finally, never EVER forget about the machine’s quality. It should be tough against heavy use and durable to last for a long time. Think about the wattage as well to guarantee one powerful bread machine. When it comes to convenience, the machine should have sensitive push buttons so you can be precise on your adjustments. A big LCD display is also crucial to avoid small mistakes when you input some numbers. Of course, cleaning convenience is also important. The interior pan should be nonstick, removable, and dishwasher-safe. 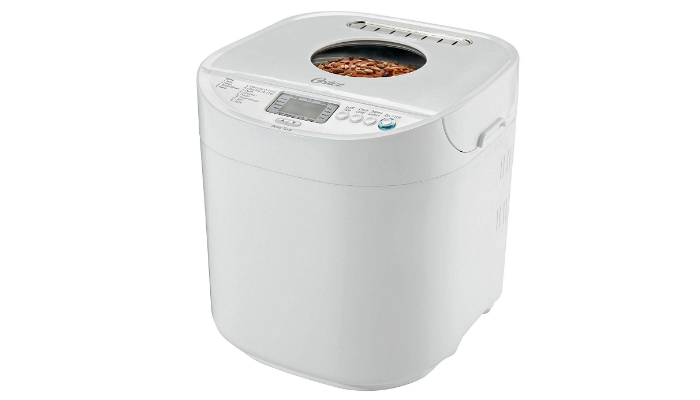 Because of its credibility when it comes to versatility, ergonomic features, and affordable price, Oster Ckstbrtw20 Expressbake Breadmaker is the best budget bread machine. It is perfect for novice bakers who just want to eat freshly-baked bread every day. Before baking something in the bread machine, you obviously have to mix some ingredients first to make the dough. Fortunately, we have a list of the best stand mixers for breadmaking.